Homelab - Lab Access Made Easy with Free Veeam Powered Network - VIRTUALIZATION IS LIFE! A couple of weeks ago at VeeamON we announced the RC of Veeam PN which is a lightweight SDN appliance that has been released for free. 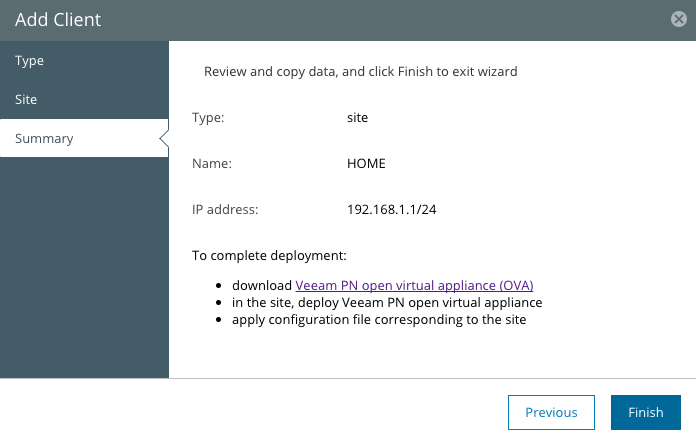 While the main messaging is focused around extending network availability for Microsoft Azure, Veeam PN can be deployed as a stand alone solution via a downloadable OVA from the veeam.com site. While testing the product through it’s early dev cycles I immediately put into action a use case that allowed me to access my homelab and other home devices while I was on the road…all without having to setup and configure relatively complex VPN or remote access solutions. There are a lot of existing solutions that do what Veeam PN does and a lot of them are decent at what they do, however the biggest difference for me with comparing say the VPN functionality with a pfSense is that Veeam PN is purpose built and can be setup within a couple of clicks. The underlying technology is built upon OpenVPN so there is a level of familiarity and trust with what lies under the hood. 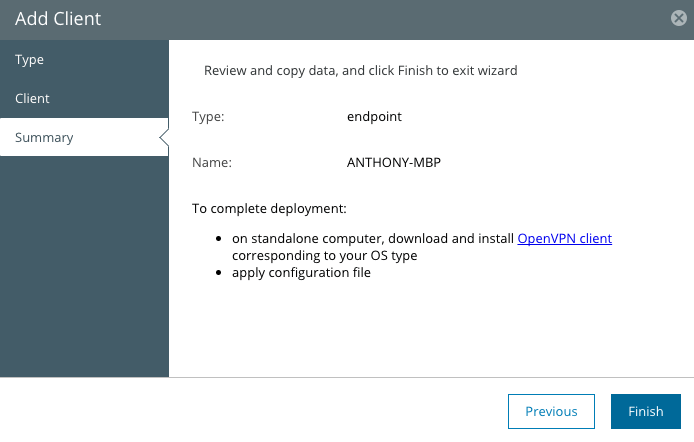 The other great thing about leveraging OpenVPN is that any Windows, MacOS or Linux client will work with the configuration files generated for point-to-site connectivity. While on the road I wanted to access my homelab/office machines with minimal effort and without the reliance on published services externally via my entry level Belkin router. I also didn’t have a static IP which always proved problematic for remote services. At home I run a desktop that acts as my primary Windows workstation which also has VMware Workstation installed. I then have my SuperMicro 5028D-TNT4 server that has ESXi installed and runs my NestedESXi lab. I need access to at least RDP into that Windows workstation, but also get access to the management vCenter, SuperMicro IPMI and other systems that are running on the 192.168.1.0/24 subnet. As seen above I also wanted to directly access workloads in the NestedESXi environment specifically on the 172.17.0.1/24 and 172.17.1.1/24 networks. 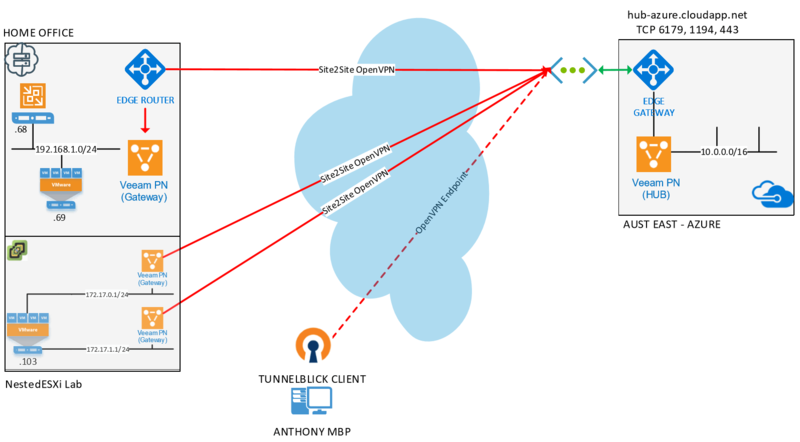 A little more detail on my use case in a follow up post but as you can see from the diagram above, with the use of the Tunnelblick OpenVPN Client on my MBP I am able to create a point-to-site connection to the Veeam PN HUB which is in turn connected via site-to-site to each of the subnets I want to connect into. As mentioned above you will need to download the Veeam PN OVA from the veeam.com website. This VeeamKB describes where to get the OVA and how to deploy and configure the appliance for first use. If you don’t have a DHCP enabled subnet to deploy the appliance into you can configure the network as a static by accessing the VM console, logging in with the default credentials and modifying the /etc/networking/interface file as described here. The OVA is 1.5GB and when deployed the Virtual Machine has the base specifications of 1x vCPU, 1GB of vRAM and a 16GB of storage, which if thin provisioned consumes a tick over 5GB initially. Note that as part of the initial configuration you can configure the site-to-site and point-to-site protocol and ports which is handy if you are deploying into a locked down environment and want to have Veeam PN listen on different port numbers. In my setup the Veeam PN Hub Appliance has been deployed into Azure mainly because that’s where I was able to test out the product initially, but also because in theory it provides a centralised, highly available location for all the site-to-site connections to terminate into. This central Hub can be deployed anywhere and as long as it’s got HTTPS connectivity configured correctly you can access the web interface and start to configure your site and standalone clients. To complete the configuration of the Veeam PN Site Gateway you need to register the sites from the Veeam PN Hub Appliance. When you register a client, Veeam PN generates a configuration file that contains VPN connection settings for the client. You must use the configuration file (downloadable as an XML) to set up the Site Gateway’s. Referencing the digram at the beginning of the post I needed to register three seperate client configurations as shown below. Once this has been completed I deployed three Veeam PN Site Gateway’s on my Home Office infrastructure as shown in the diagram…one for each Site or subnet I wanted to have extended through the central Hub. I deployed one to my Windows VMware Workstation instance on the 192.168.1.0/24 subnet and as shown below I deployed two Site Gateway’s into my NestedESXi lab on the 172.17.0.0/24 and 172.17.0.1/24 subnets respectively. From there I imported the site configuration file into each corresponding Site Gateway that was generated from the central Hub Appliance and in as little as three clicks on each one, all three networks where joined using site-to-site connectivity to the central Hub. To be able to connect into my home office and home lab which on the road the final step is to register a standalone client from the central Hub Appliance. Again, because Veeam PN is leveraging OpenVPN what we are producing here is an OVPN configuration file that has all the details required to create the point-to-site connection…noting that there isn’t any requirement to enter in a username and password as Veeam PN is authenticating using SSL authentication. 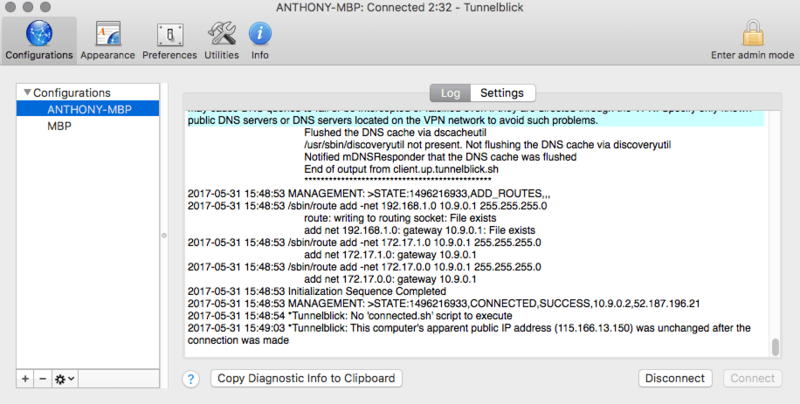 For my MPB I’m using the Tunnelblick OpenVPN Client I’ve found it to be an excellent client but obviously being OpenVPN there are a bunch of other clients for pretty much any platform you might be running. 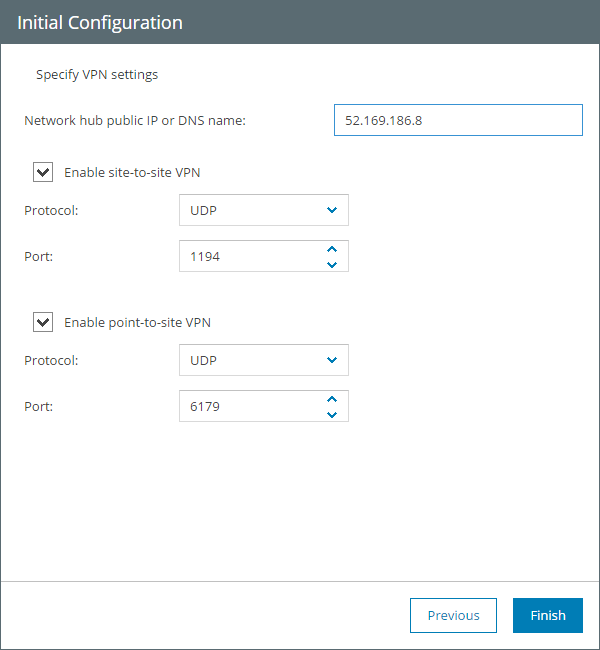 Once I’ve imported the OVPN configuration file into the client I am able to authenticate against the Hub Appliance endpoint as the site-to-site routing is injected into the network settings. You can see above that the 192.168.1.0, 172.17.0.0 and 172.17.0.1 static routes have been added and set to use the tunnel interfaces default gateway which is on the central Hub Appliance. This means that from my MPB I can now get to any device on any of those three subnets no matter where I am in the world…in this case I can RDP to my Windows workstation, connect to vCenter or ssh into my ESXi hosts. Those five steps took me less than 15 minutes which also took into consideration the OVA deployments as well…that to me is extremely streamlined, efficient process to achieve what in the past, could have taken hours and certainly would have involved a more complex set of commands and configuration steps. The simplicity of the solution is what makes it very useful for home labbers wanting a quick and easy way to access their systems…it just works! Again, Veeam PN is free and is deployable from the Azure Marketplace to help extend availability for Microsoft Azure…or downloadable in OVA format directly from the veeam.com site. The use case i’ve described and have been using without issue for a number of months adds to the flexibility of the Veeam Powered Network solution. Nice informative post, I’ll also try Veeam PN in my home-lab.